Meet the most expensive stick vacuum Consumer Reports has ever tested. Is it worth the price? Update: In February 2019 Consumer Reports removed all Dyson models from its list of recommended stick vacuums due to poor reliability ratings. For full details, read our article, "Dyson Stick Vacuums Lose CR Recommendation Over Reliability Issues." This review of the Dyson Cylcone V10 Absolute was originally published in August 2018. If you shell out $700 for a stick vacuum, you probably expect the very best. Dyson claims the Cyclone V10 Absolute is just that—touting tech advances such as a new ceramic shaft in the motor “three times harder than steel’’ and waving patents that go with them. But when the dust settled in CR’s labs, the results of all our tests didn’t add up to peerless performance. To be clear, the new V10 is a terrific stick vac, and it earns an Excellent Overall Score in Consumer Reports’ ratings. But it’s not the best. That title goes to its predecessor, Dyson’s V8 Absolute—which sells for $200 less. Consumer Reports purchased a Cyclone V10 Absolute and ran it through our gauntlet of stick vacuum tests. Weighing in at 5.9 pounds and measuring roughly 49 inches, the V10 has a long metal shaft, a clear plastic dust bin, and a trigger handle. It’s fairly easy to operate with one hand, and it drives well on medium-pile carpet. Here’s the blow-by-blow account of its performance. The V10 is terrific at cleaning carpet. On medium-pile carpet, our testers found that it expediently sucked up debris (a technician-calibrated mix of cat hair, rice, and Cheerios), eliminating visible surface litter in less than 23 seconds. Dyson’s closest competitor, the Shark IonFlex 2X DuoClean Ultra-Light Cordless IF251, doesn't pick up nearly as much debris from carpet surfaces as the Dyson V10 or its predecessor, the V8. The V10 is effective at cleaning up along edges and on bare floors. It left tile very clean, with little visible surface debris. Again, aces. This stick vac is loud. It falls below the threshold at which we recommend hearing protection (85 decibels), but it is loud enough to annoy those with sensitive hearing. On maximum mode, the sound power of a V10 reaches 78 decibels. For reference, that would sound about 60 percent louder than the V8. Although we don’t give vacuums a convenience rating, we do look at design and ergonomics and factor those elements into the Overall Score. The Cyclone V10 has a good-sized dustbin, which means fewer trips to the trash can. But to access the bin for emptying, you need to remove the wand; this is difficult and a bit of a nuisance. With a 25.2-volt lithium-ion battery, the V10 can run on low power for 52 minutes per charge, about a third longer than earlier Dyson stick vacs. At the max power setting, it runs for a paltry 6 minutes. Also, using any Dyson stick vacuum means holding down a trigger the entire time you’re cleaning. There’s no on/off switch. For those who may not have the strength or agility to keep the trigger down while holding and steering the vacuum, Dyson models are not a great option. Claim: The V10 has 25 percent more carpet pickup. Finding: True, relative to Dyson's previous model. It's accurate to say the Cyclone V10 can pick up 25 percent more dirt than the V8 in our embedded dirt test—a test typically reserved for larger upright and canister vacuums. Does that mean it can take the place of a full-size vacuum? Not according to our data. “If we are to compare the performance of the V10 to the performance of an average upright model in our ratings, both the V10 and V8 would earn a rating of Good, or a 3 out of 5, in our carpet test rating,” explains Susan Booth, who oversees CR’s vacuum tests. Claim: The V10 has the suction power of a corded upright. Typically, we don't perform suction tests on stick vacuums, because as a class they can’t handle the test. We created a modified version of our suction test for the Cyclone V10, using less wood flour than we normally do, to account for a stick vacuum’s smaller bin capacity. The verdict? Our engineers found that the Cyclone V10 would score a Fair rating, or a 2 out of 5, compared with the rest of the corded uprights in our tests. So, technically, yes, it’s as powerful as a corded upright—just a poor-performing model. But it can’t compete with an upright that we would recommend. Claim: The V10 has up to 60 minutes of cordless power. We took this claim—printed on the box—at face value, and ran the V10 with the powerhead, which we believe represents how most consumers would use the vacuum, and is how we typically test for run time. At the Cyclone V10’s max power setting, the stick runs for an average of 6 minutes. At medium power, the Cyclone V10 runs for about 28 minutes. On the lowest setting, the Cyclone V10 runs for 52 minutes—still 8 minutes shy of the 60 minutes in bold print. We spoke with Dyson about this, and a rep told us that the "up to 60 minutes" claim only applies to use with tools, not the powered brush roller heads. So we ran another test using the crevice and brush tools. The battery ran for exactly 60 minutes. In Consumer Reports’ 2017 Summer Survey on Vacuums, 24 percent of CR members who owned Dyson stick vacuums said that their model broke, putting Dyson at the middle of the pack among six brands for CR’s predicted reliability rating. 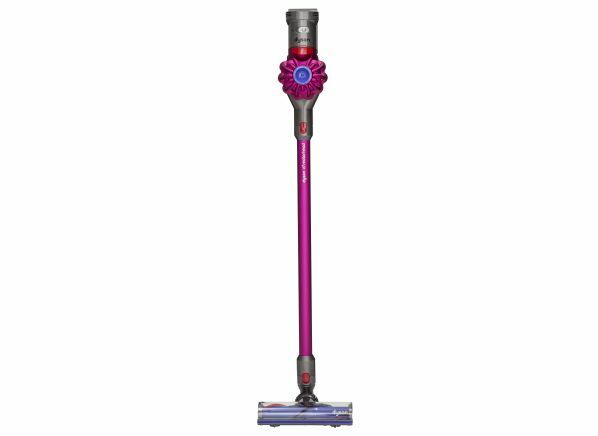 That Dyson is not tops in reliability is important in the context of a $700 stick vac. In our labs, the carpet head on the Dyson Cyclone V10 Absolute stopped working during testing, though it’s tough to say what the problem was. At Consumer Reports, we don’t consider it statistically significant when one unit breaks. In spite of the run-of-the-mill reliability score, Dyson owners really like their machines: Our recent survey reports that CR subscribers who own a Dyson stick vacuum are highly likely to recommend it to someone. It earns a satisfaction rating of Excellent. 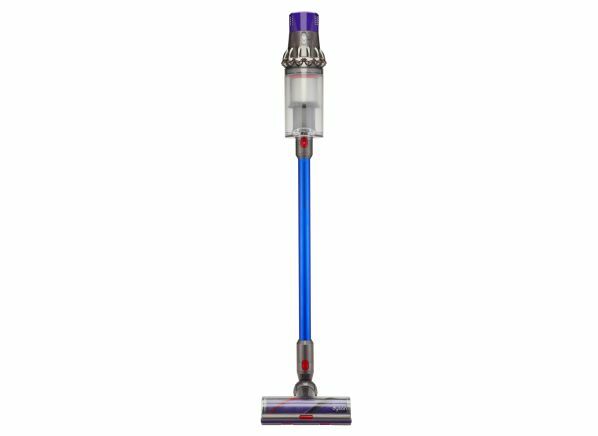 Here’s a brief history of the Dyson stick vacuums leading up to the V10, in chronological order. If you look at the numbers, the Dyson Cyclone V10 Absolute is not worth the investment. A $700 second vacuum should ace all our tests, and the V10 falls short in a few ratings. It is noisy, and the dustbin is tough to empty. Yes, it has a long charge and an impressive amount of power, but if you’re in the market for a Dyson, you can expect roughly the same cleaning capability from the V8 Absolute and save yourself a couple hundred bucks. In the market for a new vacuum cleaner? CR expert Sue Booth shows "Consumer 101" TV show host Jack Rico how Consumer Reports puts models through the paces. Correction: An earlier version of this article incorrectly compared the sound power of the Dyson V10 with that of two Dyson V8s running at the same time. In fact, the V10 in max mode would sound about 60 percent louder than the V8 in its max mode.